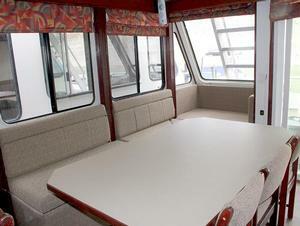 At 16 feet wide and 63 feet long, the Sunbreezer is the definition of spacious, sleeping up to 18 people. 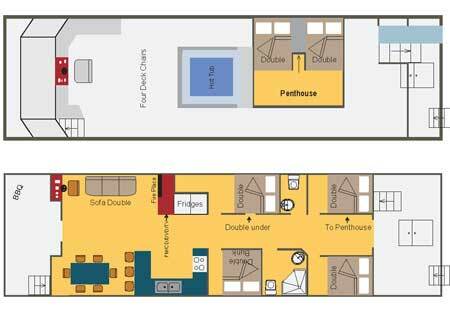 The sleeping arrangements consist of two penthouse rooms with double-beds, three staterooms with queen beds, a bunk room, a cuddy room with double beds and a sofa that folds out into a double bed. 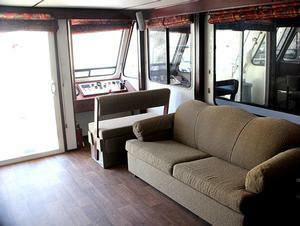 Some houseboats truly are floating palaces and this is one of them - you will never lack for room to sleep. 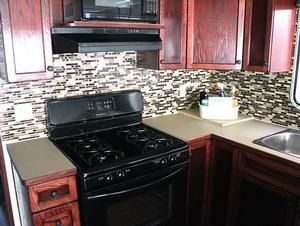 The kitchen has a similar roominess, home to a full-size range, two refrigerator and plenty of storage space. The sink is even stainless steel. The bathroom has a similar home-style comfort to its design, with a vanity as well as toilet and shower. 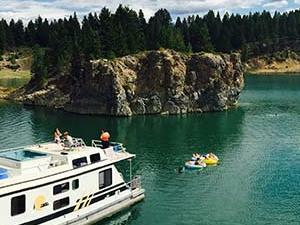 Head out to the front deck for a barbecue, then climb the stairs to the upper deck to steer from the fly bridge. 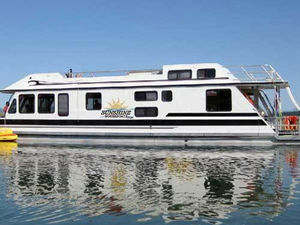 The Sunbreezer is also designed for recreation. 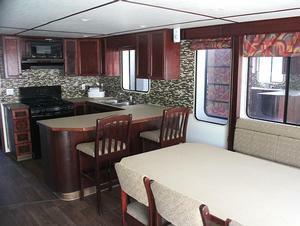 Inside, you'll find a TV with DVD player, as well as a CD stereo. Outside is not only another stereo, but a hot tub and waterslide. Slip down into the water or soak under the stars.